Does your child hate drinking cow’s milk? Does he often complains of stomach aches or skin rashes after drinking cow’s milk? If yes, then your child most likely is not throwing a tantrum but is suffering from milk allergy. 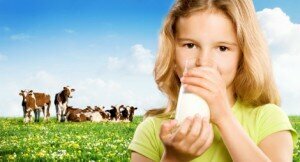 Allergies from milk and dairy products are more common among children as compared to adults. Estimates suggest that 2 to 5 % of infants are allergic to milk. 80% of these children will “outgrow” the milk allergy by the age of 6. Still, it leaves a considerable percentage of children who carry their milk allergy into adult hood without finding allergy relief. An allergy is caused when the immune system reacts inappropriately to a substance. The immune system performs the function of recognizing foreign proteins (antigens) present in the body (primarily when food is consumed) and forms antibodies called Immuno-Globulins. When the IG’s come across antigens, these antibodies fight them, leading to destruction of that specific microorganism. In those with allergies, the immune system misbehaves by forming antibodies or markers against safe protein substances by misidentifying them as harmful and marking them for destruction. Those allergic to milk are actually allergic to many proteins present in cow’s milk. The two main components of milk proteins are Casein and Whey. 80% of the protein in milk consists of casein and the rest is accounted for by Whey. The immune system considers these milk proteins to be dangerous foreign elements, and initializes a series of reactions to remove them out of the body. * Skin Reactions: These include hives, eczema, red rashes, swelling of lips, face, tongue, mouth or throat. * Intestinal and Stomach Reactions: These symptoms include stomach ache, vomiting, cramps, diarrhea and bloating. * Misc. Symptoms: Besides above mentioned specific symptoms, there are other symptoms like excessive sneezing, runny nose, watery eyes, increased coughing, sneezing, decreased brain function, and decreased immune health. What is disturbing is that none of the above symptoms can confirm milk allergy. The only way to ascertain a milk allergy is to closely monitor the diet and subsequent reactions. Unfortunately, there is no allopathic cure to properly treat milk allergy. Allopathic medication too fails to provide any cure. The problem is the fact that milk and dairy products are an integral part of the diet. Be it adult or children, milk is fundamental to every diet. The only sure shot method is to avoid the allergen, which in this case are milk and other dairy products. However, it is not easy as a major portion of diet comes from dairy products especially milk.